Now lets look at weekly chart of Nifty in 2008; and try to spot similarities between what happened in 2000-2002 and what scenarios can play out now. Let’s compare 2000-2002 period with current period of 2008 and what scenarios can play out of it’s the exact repeat of 2000-2002 period. 4.There was 20% bounce after market touched 200 week ma and it happened during Oct-Feb which is good period of equities. 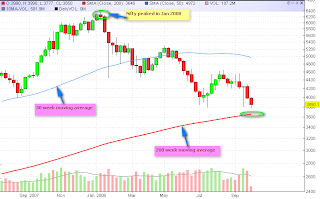 5.The market then tumbled below 200 week moving average in March 2001. 6.The market sharply tumbled 30% on break below 200 week moving average. It means we may see a strong bounce in next 3-4 months before we see another sharp correction. After crossing the 200 SMA market is bear market. that is a nice one bramesh. Good insight and food for thought. I too have a blog on nifty. I tried to see your profile but could not get too many details. Would be nice to know you.